Athletes, parents, coaches...all participants in AYLA Welcome to our youth lacrosse program for this Spring season. As expressed in the organization's statement of purpose, it is our goal to teach and refine the skills of lacrosse while embracing the highest ideals and standards of sportsmanship. There is a greater goal, however; and that is to have fun. As we play, as we coach, as we cheer...as we participate in the development of our children as well as ourselves, we must respect each other and keep a proper perspective. We should enjoy ourselves! Keep in mind this simple but effective rule of conduct and all will be fine, 'players play, coaches coach and parents cheer!'. That's as simple as it gets. For AYLA, winning means not only superiority on the field, but more importantly, maintaining a model organization. The guidelines that we enumerate here will seem to you very basic and obvious. We feel they are as well. However, given the highly competitive nature of this sport, it will undoubtedly do us all good to keep these points in mind when dealing with each other and participants of opposing organizations at all times, especially during the height of an intense game. A contract to support these guidelines and ideals of sportsmanship have been distributed to all team coaches, each player and their parents. Take the time to review the section that applies to you. If you are parents of younger athletes, read their section to them and help them to understand what is expected of them.  The Annapolis Youth Lacrosse Association is honored that you have chosen our league and wish to play the game of lacrosse as a "BAY RAIDER". We have made every effort to offer you the best we can in equipment, facilities, coaching staff, and organizational support. We hope that you will take advantage of all we have to offer, improve yourselves and use what you have learned to become, not only better lacrosse athletes, but better people. In return, we ask that you follow these guidelines of common courtesy. RESPECT - Treat all coaches, officials, teammates, opponents, and fans with respect at all times. NEVER use profane, abusive, insightful, or disrespectful language or gestures. Play within the bounds of good sportsmanship. The coach has the responsibility to keep team harmony. If you exceed the bounds of decent behavior, he will discipline you. KEEP YOUR COOL - Maintaining your composure is not always easy during the intensity of the game. When an opposing athlete takes a cheap shot or an official makes a call with which you disagree...KEEP YOUR COOL. Do not argue with the referee, do not curse, do not throw your stick. If you allow such incidents to distract your concentration, you will be effectively taking yourself out of the game. Winning is important, so also is playing well; but not at the cost of demeaning another person or team. PARTICIPATE TO THE BEST OF YOUR ABILITY - You have all heard this a thousand times. Remember it. Act on it. If you give 100% during the practice and games, you will increase your level of efficiency and you will reduce your chances of getting hurt. A high percentage of injuries occur when athletes are "goofing-off' and/or not playing at "full speed". ATTENDANCE - There has been a decided effort by the organization to keep the teams such a size that the coach can maximize playing time for all. Attending ALL practices and games will not only improve your ski II level, but will also go a long way in helping the coach decide who should play. You need to communicate to your parents how important playing the game is to you, and that missing or being late for practices and games hurts your chances of fully participating. Extenuating circumstances are unavoidable...when they occur pick up a telephone and call the coach so that he can adjust his plans. Whether you are the best player on the squad or not, you are an integral part of your team. Your absence hurts EVERYONE! CONCENTRATION - If you ever found yourself NOT knowing what to do on the field, it is probably because you did not listen in practice. The coach has a limited time to teach the basics and skills of the game to you. Practice time is short, so your FULL attention is required. If someone is disruptive during these sessions, or does not listen, the team suffers. The results are obvious, but not unavoidable. Discipline yourself...Pay attention and listen carefully...Do not be afraid to ask questions, if you do not understand. Games are lost by teams with superior skill when they lose their concentration. HUSTLE - Show yourself and the coach how quick and active and agile you can be. Always be on the move...RUN. If you don't like to run, find another game. Remember that it is inevitable that an athlete will play in the games as he plays in practice. Hustling is not only a state of motion, but also a state of mind. When participating always be alert...be involved...and if in the action, be in motion. BE A TEAM PLAYER - Excelling as an individual is an admirable goal. One to which we all aspire. To succeed in this goal requires much from the individual as well as from his teammates. Lacrosse is a team sport. Moving the ball successfully around the field requires coordination and cooperation among 10 athletes. The more proficient these athletes become at their respective positions, the faster the ball will move; and, ultimately, the more the team will win. I will always demonstrate good sportsmanship. I will always be respectful and keep my composure. I will participate to the best of my abilities. I will attend all practices and games fully equipped and ready to play. I will be on time to all practices and games. I will listen and adhere to the advice of the coach. I will playas a member of the TEAM. Through the myriad of concerns and issues that surface during our lacrosse season. it is inevitable that, as parents, we will focus on our child athlete and how he is affected. However, as members of the AYLA, we must broaden our perspective to view not only the good of the individual, but also that of the whole. The goals of this organization can only be realized with the support and involvement of its members. RESPECT - Set the example. Treat all coaches, officials, athletes, opponents, and fans with respect. If you have a concern, deal with it in a decent manner. COMPOSURE - Set the example. There are parents who become overwrought at the inequities their child faces, e.g. bad officiating, baggy uniform shirts, etc. If you are so inclined, remind yourself that we are not the World Lacrosse League. As our children will take their cue from us, remember to keep your cool. BE INVOLVED - Maintain a level of enthusiasm that neither crushes the child nor leaves him wanting. Support and nurture your child's interest in the game by taking an active role. Realize that the team preparation and practice requires the attendance of all athletes. At any level of competition, it is obvious that an athlete who is absent, tardy, or ill equipped to practice can not fully participate. Consider the time and interest of the coaches and teammates when your child indiscriminately misses practice. The teams will be kept purposefully limited in size based on the premise that ALL participants commit to ALL practices and games throughout the ENTIRE season. Make sure your child arrives on time, is properly equipped, and ready to play. Discipline your child to respectfully adhere to the advice of the coach. Support the coach's role as a teacher and a figure worthy of respect. Support the structure and discipline that is necessary in a learning environment. Back the coach if he disciplines your child for stepping beyond the bounds of decent behavior whether on or off the field. Interpret instructions or discipline from the officials or coaches to your child as opportunities for them to learn and improve. Instill in your child the team concept. Encourage the individual, but remind him that the success in lacrosse is derived from the team effort. To our coaches and their assistants who give unselfishly of their time, AYLA is particularly beholden. Moreover, due to the inherent responsibility and trust that is so much a part of your position, the organization can not emphasize strongly enough how important it is that you uphold the highest ideals of fair-mindedness and gentlemanly behavior. RESPECT - Treat all coaches, officials, athletes, parents, and fans with respect at all times. Never use profane, abusive, insightful, or disrespectful language or gestures. KEEP YOUR COOL - As the athletes and parents look to you to be the impetus for the team, maintain your perspective. Remember the goal is to teach. PLANNING - Employ some methodology to your coaching, i.e., apply a structure to your practice and game plans in an effort to maximize the athletes' learning curve and their playing time. DISCIPLINE AND RESPECT - Set the example. You will earn respect by showing respect. Communicate to the athletes from day one that you expect them to treat everyone with respect. Promptly discipline each and every athlete for unbecoming behavior no matter how intense the situation in practice or games. As coach, you have a responsibility to maintain team harmony. When an athlete in his actions exceeds the bounds of decent behavior, on or off the field while in your charge, deal with the situation immediately. With regard to the degree of discipline, it is obvious to stay within the bounds of reason. You are closest to the situation and you will be best guided by good judgment. Be consistent. Treat all athletes' and parents' requests and/or concerns with both understanding and respect. EQUALIZING OPPORTUNITY - Remember that all of the athletes participating on your team not only want, but deserve, to play their fair share of every game. This means that each athlete is afforded the opportunity to contribute regardless of his ability. If you instruct your players properly and blend their respective talents wisely, this can be accomplished without loss of competitiveness. While winning is important, the more desirable goal is providing for all the athletes a strong knowledge of the fundamentals, a true sense of teamwork, and fun participation for everyone. TEAM PLAYER SELECTION - If athlete registration and skill level warrants, AYLA will field teams to be competitive in the county at all levels in each age group, i.e., A, B, and C level teams. All AYLA registered athletes will be chosen for the available teams in their appropriate age levels by the coaches' pre-season evaluation and on field tryouts. In compliance with Anne Arundel County regulations, athletes cannot play below the group level designated by their age. AYLA fields teams in four age groups: Clinic, Pee Wee, Midgets and Juniors. At the Clinic level, the games are instructional, i.e., there will be coaches from both teams on the field of play to instruct and referee during games. No formal team standings or statistics are kept. The make-up of the teams has more to do with keeping it all fun and less to do with the skill levels or experience of the athletes. PEE WEES: The Pee Wee level is also an instructional league. Again, no standings or records are kept. Anne Arundel County has recently done away with the Pee Wee " A" (Premier) League and County rules now prohibit any organization from fielding an "A" team at the Pee Wee level. All organizations are now required to attempt to balance their Pee Wee teams. These rules were implemented to remedy some of the competitive inequities of years past and to clearly underscore the instructional nature of the Pee Wee division. Thus, AYLA is obliged to field Pee Wee teams which are as equal in skill and ability as is possible. The selection process for our Pee Wee teams reflects this goal and is geared to comply with the County mandate. MIDGETS AND JUNIORS: Where athlete registration and skill level warrants, AYLA fields Midget and Junior teams to be competitive in the County at all skill levels, i.e., A, B, and C level teams. Lastly, in compliance with Anne Arundel County regulations, athletes cannot play below the group level designated by their age.